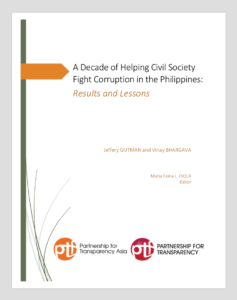 A Decade of Helping Civil Society Fight Corruption in the Philippines: Results and Lessons details the results and lessons of a decade long (2003-2013) Partnership for Transparency Fund (PTF) support to Filipino civil society organizations (CSOs) to fight corruption. It celebrates the successes and reflects on challenges faced as PTF enters a new phase in the Philippines – a regional affiliate called PTF Asia as a foundation headquartered in Manila. As efforts worldwide and in the Philippines have evolved during these ten years, the discussion in this Report offers lessons in going forward towards this new phase as well as initiatives beyond the Philippines. The PTF program in the Philippines is divided into three phases: One-on-One Partnerships (Pre-country Program 2003-2007), Country Program (2007-2012) and Post-country Program (2013-2015). The various initiatives provide many lessons of the do’s and don’ts of such efforts. The case studies attempt to depict a balanced view on the strengths and weaknesses of each program. A number of crosscutting lessons for defining critical pre-conditions for an initiative are likewise illustrated in the Report. But the Report stresses that the most persistent and difficult challenge relates to the sustainability of such efforts. Both the need to maintain momentum and active participation among volunteers beyond an initial phase present serious risks. Moreover, the search for sustainable and dependable funding for a longer term threatens the sustainability of all cases.